Rosters have been finalized for Friday night’s 4th annual Comm. Ave Charity Classic at Walter Brown Arena, where BU and BC alums, along with a number of guests, will face off. Proceeds of the game will benefit The Travis Roy Foundation, Compassionate Care ALS and the Pete Frates Home Health Initiative. The previous three games raised more than $180,000. The Terrier roster includes Jack Eichel, Evan Rodrigues, Danny O’Regan, Clayton Keller, Nick Bonino, Charlie McAvoy, Matt Grzelcyk, Jay Pandolfo and many more. Tickets are $15.00 and can be purchased from Ticketmaster and at the arena. Raffle items. SecondCityHockey.com has pegged BU freshman Jake Wise as the Blackhawks #10 under-25 prospect, calling him a “candidate to be the steal of the draft.” The center from North Andover, Massachusetts who impressed at Chicago’s development camp, has been called a “third round pick with first round talent.” Wise tallied 43 points in 38 games for the NTDP U18s last season. Junior defenseman Chad Krys, a second-round Blackhawks selection in the 2016 draft, earned Second City’s #13 ranking. Krys, who will be a co-captain this year, was sixth in scoring for BU last season with 27 points (7G, 20A). 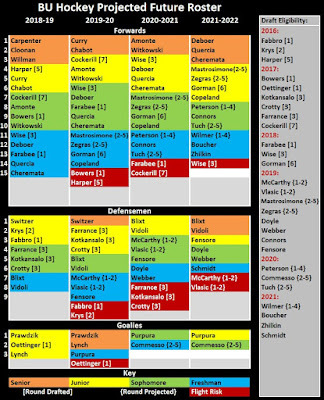 MileHighHockey.com’s Top 25 Under 25 for the Avalanche ranks Terrier sophomore center Shane Bowers at #10. Drafted in the first round of the 2017 draft by Ottawa and later traded to Colorado, Bowers earned Hockey East All-Rookie honors after a 32 point season (17G, 15A). CTV News interviewed with '20 recruit and projected 2020 first rounder Dylan Peterson as he prepares for his first season in the National Team Development Program. 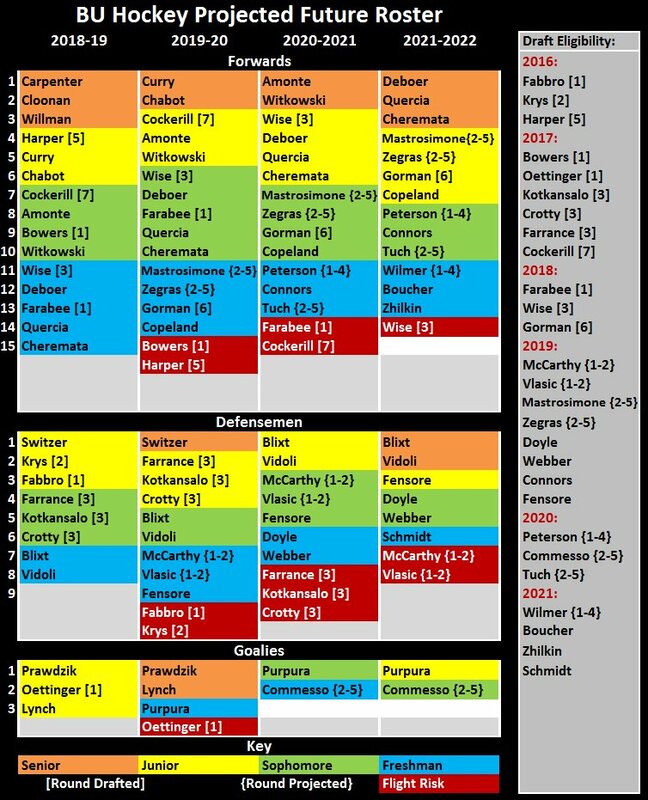 @BurntBoats' latest roster chart shows 26 players on the 2018-19 Terrier squad plus projected rosters for the next three seasons. The most recent committed recruit, forward Brian Carrabes will come aboard in 2020-21. Entering his second full season with the Bruins, Charlie McAvoy expects a very competitive training camp with only a few spots up for grabs. The former Terrier All-American will be on the ice at Walter Brown Arena Friday for the Comm Ave. Charity Classic. Then, he’ll head to Plymouth, Michigan for Sunday’s Stars and Stripes Showdown, where former BU head coach and new Rangers head coach David Quinn will coach one of the teams. Brien Diffley has been signed to a contract by the Wheeling Nailers, the Pittsburgh Penguins’ ECHL affiliate. The Burlington, Massachusetts native will play for new Nailers coach—and former BU associate head coach—Mike Bavis. AJ Greer talked with ColoradoEagles.com about expanding his game and earning a spot on the Avalanche roster this season. Sahir Gill has signed on with the Augsburger Panthers of the German DEL. SB Nation’s Women’s Hockey Top 25 Under 25 for 2018 pegs Terriers All-American Victoria Bach at #10. BU’s all-time leading goal scorer with 104, Bach has signed a contract with the CWHL’s defending champion Markham Thunder.